In this review, I’m going to compare two speakers. The first one is UE Boom 2 from Bose and the second one is Flip 4 from JBL. They are very similar when it comes to size and portability. We will take a look at how good are they when it comes to the build quality and water resistance? Let’s find out whether the Bluetooth connection is consistent, and of course, the most important part for many – how good is the sound quality. Boom 2 is a bit taller than JBL Flip 4, but also thinner. It’s 178 mm tall and 64 mm in diameter and weighs 548 grams, making it super easy to carry around. You can take it everywhere you want: to park, on a trip and on a beach. The speaker is wrapped in a tight fabric, separated by a rubberized control strip where you can find unique UE plus and minus buttons. Thanks to the better seal, the speaker is not only splash proof as its older brother but also received an IPX7 certificate, which means that it can be submerged in water up to 1 meter for 30 minutes. Just don’t take it on a boat – it won’t float, unlike the bigger UE Megaboom. If you accidentally drop it into a dirt, you can use a hose and clean it up. Leaving it in rain also won’t be a problem. There is a small metal hook on the bottom of the device where you can attach a carabiner clip or a twine. It may look strange at first, but It’s very practical idea. It can be hung on a branch of a tree or on a hanger. You can control the speaker by tapping – tap it once to pause the music or tap it twice to skip to the next song. On the top of the device, you will find two buttons: the power button and the Bluetooth pairing button. Going to the bottom, there is a flap that covers the 3.5 mm port to connect your device physically and the micro-USB charging port. Flip 4 is a direct competitor to Boom 2, so there are a lot of similarities especially when it comes to a design. It offers a similar cylindrical shape that is easy to hold in a hand. While Boom 2 is primarily designed to be used vertically, the Flip 4 should be used horizontally. It can also be stood up vertically, but there is a slight problem with this because on both sides of the speaker there are passive radiators. If you use it standing up you are blocking one of the radiators, slightly distorting the sound. Similarly to Boom 2, there is a lanyard that allows you to hang the speaker in a vertical position, which is good because the air from the passive radiators is not blocked by a surface. While Flip 3 is splash-proof, Flip 4 is waterproof and offers the same IPX7 certification as Boom 2 and can be used in a bathroom or submerged in a water. This requires the same rugged fabric to be used in order to keep water away from the electronics. JBL Flip 4 has also a 3.5 mm port to connect your device wirelessly and a micro-USB charging port. Both ports are hidden under a rubber flap. 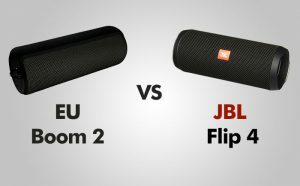 When we talk about Boom 2 or Flip 4, we have to remember that they are cheaper and smaller than other less portable speakers such as JBL Xtreme or UE Megaboom. Size is a big issue when it comes to speakers especially in the bass department. Boom 2 offers the great feature that not many speakers on the market offers, namely a 360-degree sound. No matter where you are, the speaker will always be directed toward you. The maximum volume is impressive and can easily fill the average size room. In the previous model, there is a problem with sound distortion when you play music at the volume higher than 75%. Now, you can crank it up to 90% and it still plays well. Besides that, the speaker is 25% louder than the original Boom, so there is much more loudness before you notice any distortions. There is not much bass coming from Boom 2, which is quite understandable considering its size. If you want to have more booming bass in a portable form consider JBL Charge 3. 40 mm drivers deliver quite a powerful sound that can fill a relatively large room with sound. Two passive radiators on both sides of the speaker work hard to deliver a better bass than its size would suggest. It’s very similar to Boom 2 – it’s there but don’t expect too much. Contrary to Boom 2, it doesn’t offer a 360-degrees sound, so keep in mind to have the JBL logo facing in your direction. UE Boom 2 comes with a dedicated app for Android and iOS. It will let you create a stereo pair with other UE speakers. The speakers will play music from the same source at the same time. UE claims that they will add new features via software updates. There is also an app for JBL Flip 4, but you won’t really need it unless you want to use some of the Flip 4 special features. This app is available for iOS and Android and allows you to change play button to activate voice assistant like Google Now or Siri. But it lacks in comparison to UE app – it doesn’t include equalizer or alarm clock that make UE’s app stand out. The connection of the speaker is quite good. UE claims 100 feet (30 meters), but I could achieve about 60 feet before I started to lose signal – about twice as much as a typical 30 feet range of most Bluetooth speakers. It comes with a well known NFC feature. The Near Field Communication is useful when it comes to pairing devices – just tap a speaker with a device and they will connect almost instantly. Boom 2 has the ability to connect with other UE speakers and play in sync from the same source. You can do this with as many as 10 UE speakers. JBL Flip 4 comes with the JBL Connect+ feature, which is the updated JBL Connect feature. It will allow you to connect up to 100 Flip 4 speakers to your device and play music from all of them at the same time. Because of this new implementation, you won’t be able to connect it to Flip 3 or older JBL speakers. However other JBL speakers like charge Flip 3, Charge 3 and Xtreme will be receiving updates so they will become compatible with this feature. UE claims a battery life of 15 hours, but from our testing, it’s about 12 hours when tested at a medium volume level. But depending on a song you will get different results. You can charge the device via the standard micro-USB cable. Pressing both (plus and minus) buttons at the same time will give you the audible reading of the current battery status. JBL has made an improvement compared to the previous model. It has 3000 mAh lithium-ion battery that gives you about 12 hours of play, after 3.5 hours of charge. It’s 20% more than the previous model and similar to Boom 2. Contrary to JBL Charge 3 or JBL Xtreme you can’t use it as a power bank – the battery is too small, so you won’t be able to charge your phone. On the bottom of the speaker, you will find five small LEDs indicating how much battery life is left. PROS: Loud / Sturdy / Water-proof / 360 degrees sound / Compact / Dedicated app / easy to pair / NFC / Can connect multiple speakers. PROS: Small / Dedicated app / LED battery indicators / JBL Connect+ / Sturdy / Water-proof. CONS: Lack of dedicated buttons / Weak bass. CONS: Lack of 360-degree sound.